Bethlehem’s Preschool meets September through May and serves ages 2 – 5 : Terrific Two’s, Thrilling Three’s, and PreK (4-5 year olds). Bethlehem United Methodist Preschool is an integral part of the outreach ministry of Bethlehem United Methodist Church. 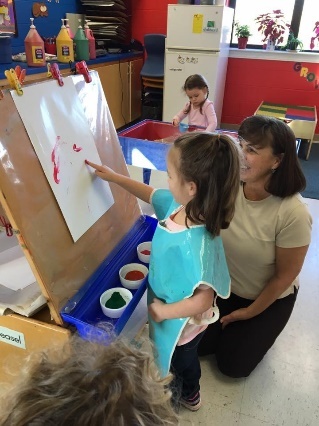 Our Preschool’s educational programs help children develop spiritually, mentally, physically, socially and emotionally while gaining readiness experiences to enhance their public school program. Our curriculum uses both Virginia Department of Education’s Foundation Blocks for Early Learning as well as Department of Social Services’ Milestones of Development as guidelines for our curriculum. Our program encourages the children to develop self-discipline, a positive self-image, a curiosity for the world around them, and an appreciation for the value of learning life experiences and education shown through God’s love. Our programs are designed to help our children develop spiritually, physically, emotionally, cognitively and socially. Each child receives individual attention and is directed toward reaching his or her maximum potential. Our programs include age appropriate guided free play, circle time, reading readiness and literacy activities, math, science, social studies, music, art, and snack or lunch. Additionally, children participate in chapel with our Pastor or Director of Children, Youth, and Family Ministries. • Develop acceptable means of expressing emotions. Bethlehem United Methodist Preschool opened its doors in 1984 as an outreach ministry of Bethlehem United Methodist Church by Sara Shackelford and Susan Tinsley, both members of BUMC. Mrs. Shackelford taught kindergarten at Body Camp Elementary for five years and at Dudley Elementary School for 21 years. She also taught at Moneta Elementary School. Mrs. Tinsley taught 6th grade at Staunton River Middle School for 22 years, before retiring. Both had children attend Bethlehem United Methodist Preschool when it started in 1984 and taught there for ten wonderful years. We are grateful to both of them for the educational experience and contributions they made to the preschool. The program is open to all members of the community and neighboring counties. Bethlehem United Methodist Preschool operates as a preschool by the Commonwealth of Virginia as a Religious Exempt Center with Department of Social Services and undergoes a renewal process annually. The Preschool is staffed by a Director with a Lead Teacher and Assistant for each class. The Director and the Lead Teachers all have a degree and/or certification in Education or related field and possess significant experience with children. Assistant Teachers are required to have a high school diploma or GED, and experience with young children. Our Teachers have over 100 years of combined experience in education!